x Two fabulous outdoor entertaining areas with BBQ facilities. The main reason people come to Ironbarks is to do nothing other than relax... Reading books by the fire, going for walks in the native bush, practicing your golf, chasing Kangaroos (good luck! ), or spotting birds. Ironbarks is a quiet place. The sort of place you come to if you want to have some time to yourself, either alone or as a group. Relax on one of the decks and choose from a number of beautiful views; the glimmer of Mt Tarrangower over the farmland in the distance, or the Australian native bush that surrounds the property. Perhaps you will be enjoying a bottle of local wine that you picked up at a winery visit, or contemplating a day spent in a nearby town. You may like to take a walk to one of the dams, and try your hand at yabbying, or just watch the animals and birds whose home we share. Early risers are especially well rewarded if they get out for an early morning walk. You can finish off a perfect day by dining under the stars. Bring your favourite coffee beans or ground. Viking Lego and books inside. Play Fort outside. Large deck on each side of house. We arrived on a cold afternoon, the fire was crackling away which was a lovely, warm welcome. The house was stocked with everything we needed and plenty of space. Surrounded by endless trees, the location is beautiful and serene. Porch was a great space (hammock was a huge hit). Booking was simple, directions were clear and Rick was a lovely host. Highly recommend and would book again. The kitchen is well equipped, the bedrooms are generously proportioned. We had the best family Holiday. The day we arrived was a scorcher and what a delight to arrive to a nice and cool house....so thoughtful. The home was spotless clean and full of everything we needed and more. It was so nice to have the property all to ourselves, so secluded. And to have a visit from some Kangaroos was so exiting. The playground and the hammock, wow what a hit with the kids. The kids enjoyed all the space for them to ride around on their bikes, they were outside all day long and well into the evening. Furniture was comfy and each room had a special touch! The kids loved their room with all the toys and those rocking chairs were such a fun treat for them. Thank you for an unforgettable week. And a special mention to Nikki, you do an amazing job with making the house so clean and inviting, and was lovely meeting you!. Cant wait to visit again..... see you soon Ironbarks! A wonderful place for a relaxing stay. Set well off the road, it's a very pretty property for a wander, and the deck is great for listening to the frogs and watching the stars. The house was spotlessly clean, the wood heater was on for us when we arrived, and the trip and settling in were made easy by Rick's clear and helpful directions. Dunolly, just up the road, is a very charming town and has a supermarket. Also, about 35 mins drive from Ironbarks is kooyoora-state-park, which has some spectacular picnic grounds and walks. We thoroughly enjoyed our stay at Ironbarks. Its only 5 minutes drive to the historic and charming country down of Dunolly. Ironbarks is a perfect weekender for us 3 couples and a single just the right amount of beds. All the rooms had heating if you needed it as it can get quite cold at night up there.plus there is a good heater in the lounge for instant heat but the really efficient wood fire heater is great. The property is very clean with many thoughtful considerations for guest. A credit to Stayz to have this property on their list. There is a cupboard with some basics food items which is very helpful if you forget something. While we didn't get to use the old clawfoot bath would be great next time. Was also fun to try setting yabby nets in the 2 dams. Very peaceful. Lovely stars. We selected Ironbarks due to its proximity for our extended family. It provided everything we wished for. A large roomy house with excellent amenities. The lounge dining area catered for 11 of us with ease with plenty of very comfortable chairs and an outstanding dining table. The wood fired heater was superb and warmed the entire house. The kitchen was very well appointed with loads of crockery and cooking essentials. The bedrooms were large and furnished wonderfully well. We enjoyed the serenity of the farm with plenty of walks through the surrounding bush and open fields. 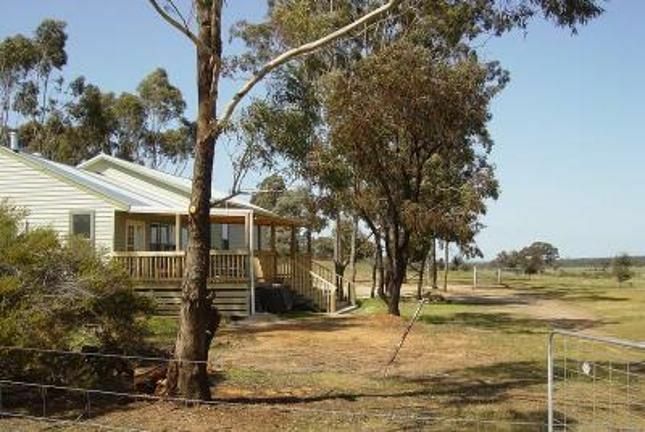 This is an excellent venue for a relaxing getaway and close to the historic township of Dunolly which has a range of unique buildings and services that met all our needs. We shopped locally where the butcher provided us with a sumptuous range of meat- highly recommended. We hope to visit Ironbarks again. Thanks Gary, Hope to have you back again.